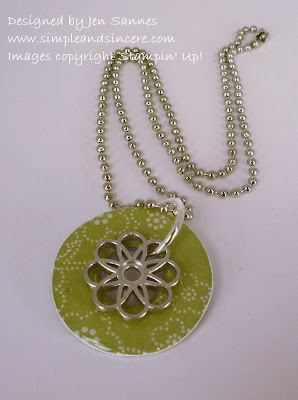 I'm sharing a few more gifts that I've been working on - washer pendant necklaces. I made a few of these and posted them earlier this month, which I kept for myself, but I wanted to make a couple for Christmas gifts as well. This first necklace I made for a young customer of mine and faithful blog reader (Hey, Lins!). She really liked the last batch of washer pendants I made, so I made her a belated birthday/Christmas present. I was told that Certainly Celery was her favorite SU! color, so I used some of the Sale-A-Bration paper I had left over from last year. I jazzed up the pendant with a Filigree Designer Brad - cute, huh? Now, on to necklace #2, which I made for my downline, Stacey. 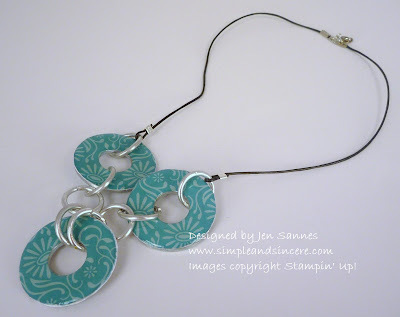 I wanted to try using more than one washer pendant on a necklace, so I made three out of the same dsp (Thoroughly Modern dsp in this case) and I found some JUMBO jump rings at a local craft store, and linked the pendant together. I love the chunky, urban look this necklace has. That's all for today! I'm still finishing up a few last minutes gifties for teachers and such, but I'm REALLY close to wrapping everything up - WAHOO! These are so gorgeous! Especially like the one with the filligree brad! Will have to have a go at this ! TFS!